A spectator signs a bill and places it under a black cloth. 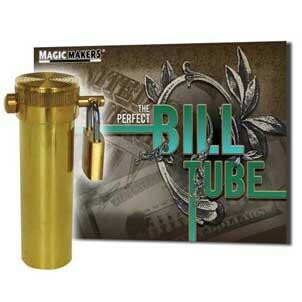 The spectator is also given a brass tube sealed with a lock. The performer takes the cloth away to reveal that the signed bill has vanished! The spectator unlocks the tube. Inside is the spectator’s signed bill! Easy to perform; comes with special cloth and illustrated directions! Furthermore, our gimmick is invisible to the eye!